Coppell Gifted Association is excited to offer our TENTH summer of local enrichment courses as a service to students entering grades 4-8 in the fall of 2017 with proceeds to be used for educator training in gifted instruction. 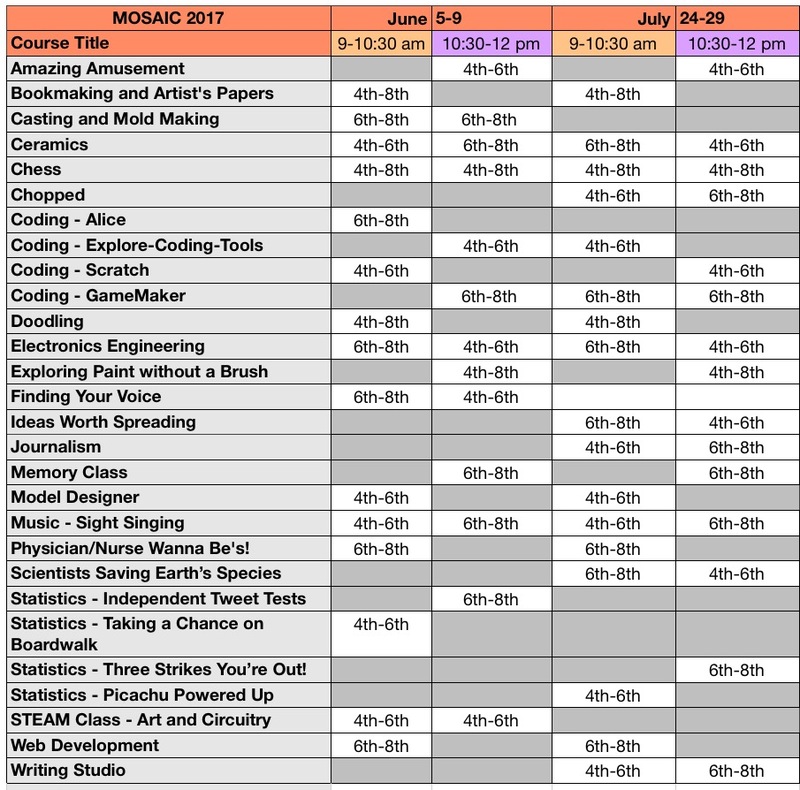 MOSAIC™ (Marvelous Opportunities Scheduled as Individual Courses) is scheduled during the weeks of June 5th – 9th, 2017 and July 24th-28th, 2017 from 9:00 a.m. – noon. More than 20 courses will be offered this summer – some will be popular courses we’ve had in the past, and some will be exciting new courses. Courses are for kids who want to explore the subject matter more deeply and are not limited to gifted students. MOSAIC™ is being taught by CISD teachers or other subject matter professionals and held at Coppell Middle School North. Please note that these may be updated if classes are added or changed. Questions about course descriptions or schedule, please e-mail Tracy at mosaic1@coppellgifted.org. To begin your registration, please complete the registration request by clicking here. Registration will open for CGA members on February 1st at 8:00 a.m. The “members only” period of registration will run until February 22nd. To qualify as a member for the “members only” registration period, you must have joined CGA on or before January 31, 2017. Members will be eligible for an additional $10 off their registration if they register for two classes in the same week of camp. This offer will only run during the “members only” registration period (discount will be applied to the members rates published below, the two classes must be taken in the same week, by the same child). Registration will open to non-members in CGA on February 23, 2017. $90 one course, $155 two courses (for same student in the same week) plus any materials fees. $105 one course, $185 two courses (for same student in the same week) plus any material fees. Non-members are eligible to register beginning February 23, 2017. Cancellations made by April 15 will be refunded 75%. Cancellations made between April 15 and May 30 will be refunded 50%. No refunds will be considered after May 30.